Food Spoilage: A New Threat? Chapter 12. Food Spoilage and Food Safety: Is There a Link? 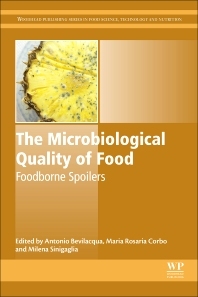 The Microbiological Quality of Food: Foodborne Spoilers specifically addresses the role of spoilers in food technology and how they affect the quality of food. Food spoilers represent a great challenge in food quality, determining the shelf-life of many products as they impact consumer acceptability of taste, texture, aroma, and other perceptions. Divided into four sections, the first section defines microbial spoilage of food, with special emphasis on methods for the evaluation of spoiling phenomena and the status of their regulatory framework, examining both existing regulations and possible gaps. The second section examines spoiling microorganisms, covering a range of common spoilage microorganisms, including pseudomonas, yeasts, and molds and spore formers, as well as less-common spoilers, including lactic acid bacteria and specific spoilage organisms in fish. The third section highlights spoiling phenomena within certain food types. Chapters cover dairy, fish, meat, and vegetables, and other products. The final section investigates emerging topics which point to future trends in the research of food spoilers. There is insight into microorganisms resistant to preservation, the role of biofilms in food quality, and the link between food safety and food spoilage, with a special emphasis on certain spoiling microorganisms which could be opportunistic pathogens. Written by an international team of leading authors, this book provides state-of-the-art coverage of this topic, which is essential to the shelf-life and quality of food. Dr. Antonio Bevilacqua is a researcher in food microbiology. He has received an MSc in Food Science and Technology and a PhD in Food Biotechnology (University of Foggia); the main topics of his research activity are table olives, fermented meat and micro-encapsulation, predictive microbiology (namely the use of the theory of the Design of Experiments and multivariate approaches), natural antimicrobials and alternative tools for food preservation, microbiology of starter cultures. He is the author of c. 150 papers. Prof. Maria Rosaria Corbo is Associate Professor of Microbiology; she gained an MSc in Biology in the University of Bari (Italy) and a PhD in Food Biotechnology in the University of Foggia. Her research topics covers a wide range in food microbiology (minimally processed foods, fermented meat and fish, fermented vegetables, natural antimicrobials, homogenization and ultrasound as tools for food preservation, predictive microbiology); she is the author of c. 200 papers. Prof. Milena Sinigaglia is the Professor Head of the Section of Predictive Microbiology; she received an MSc in Agricultural Science and a PhD in Food Biotechnology in the University of Bologna (Italy). She is Associate Editor for the Italian Journal of Food Science and her research topics cover a wide range (mathematical modeling of foodborne bacteria, natural antimicrobials and alternative approaches in food preservation, fermented foods). She is the author of c. 250 papers.